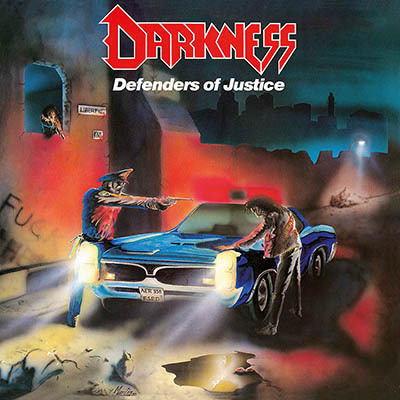 “Defenders of Justice” was the second of three proper full-length releases by Darkness before the split in 1990. Looking back today, how are Arnd’s feelings in regard to this album? “‘Defenders of Justice’ was the album which marked the silent demise of Darkness. Bruno (bass) had already been replaced by Thomas, who later left the band for Holy Moses. Olli (voc) had begun to go astray, he was not really interested in metal anymore but rather into early gothic acts like Fields of the Nephilim or Sisters of Mercy. Our guitarist Pierre was very disappointed with the whole situation and wanted to play more progressive music. These are the facts. Despite all the personal issues of that time, ‘Defenders of Justice’ is the last real Darkness album, at least for me.” If one takes a look at the past, there is a whole bunch of bands from the eighties who played great thrash tunes but never really made it big, for one reason or another. Darkness, too, have been called “one of the most overlooked things in thrash.” What’s Arnd’s opinion on this? “Perhaps they are right. - Perhaps?! No, of course they are right, hahaha! To be serious: there is some truth to that, but one important thing had been missing all the years: A sixth man in the band, a guy in the background, an adequate manager. We had to do most of the PR-work on our own, I guess that was the reason why we never made bigger steps in our career. We were young, wild and angry - pretty bad requirements for successful business men!” Sounds plausible. Now there is a second chance for “Defenders of Justice” to catch the attention of those who are into good old eighties’ thrash. Therefore the album will undergo as few changes as possible for the re-release, because “we want to transport the true 80's feeling!” Some special features will nevertheless come along with the new pressing, as Arnd reveals: “Lacky has excavated the Darkness photo treasure chest. There'll be shitloads of unpublished pictures of the band included!” According to Lacky, the only original member, Darkness had a good reason to ink the deal for the re-release with High Roller: “The sales of the re-released CDs of all Darkness album were very good, and High Roller asked us if we wanted to do the same with the vinyl versions. So they proved to have a very good sense for the scene, because the Death Squad release sold more than well.” While a couple of years ago there was already a first attempt to reanimate Darkness which was rather short-lived – we’re talking about “Eure Erben”, who played Darkness songs with German lyrics – this time round the band has bigger plans: “The first reunion was not a real reunion because we tried to link our new project to Darkness. I have to admit that we unfortunately have failed. This time it is and will be Darkness, not just another project linked to the band. We are growing from our old roots, the monster is awake again.” Arnd finds even more lofty words to describe the rebirth of Darkness: “We dug out Darkness and buried the Erben in the same grave.” The new version of Darkness sees a lot of new faces: While drummer Lacky and Arnd have been in and out Darkness since the beginning, the rest of the lot is entirely new to the game: Now Darkness have Kreator’s Speesy on bass, Bony Fertigmensch of JaKa fame on guitars, and Meik Heitkamp (git) who some might know from Trapped Insanity. How did they all find together to reform Darkness? Arnd: “No big deal! Bony played the anniversary show, he is an old companion of us anyway. Then we share our rehearsal room with Meik's band, and Speesy - Lacky, tell the legend of Speesy and you, hahaha!” Lacky: “Yes, one day we were having a beer at Speesy's pub, talking about the good old times. Back in the eighties, Speesy was a part of the Darkness family, he travelled a lot with us to support us at our shows or all other kinds of events. The anniversary show we played in December 2012 was a play along option for him, but that was not possible for him due to a lack of time. At that special drinking night he asked again if he could play bass for us, and I said OK. The circle closed again!” With that established, what else do we need to know about the re-release of “Defenders of Justice"? Arnd: “I think we've told you enough about the album. You don't need to know more about that LP but about the people we made it for. I mean the metalheads around the world who kept the spirit alive and held up the flame of Darkness through all the years. They are the sixth member of the band, and the praise belongs to them! Thanks to all the folks out there - you rule!"